Countless times, I’ve found myself struggling to explain to my fellow students at Victoria University here in New Zealand exactly how Amherst operates. I start off by talking about how liberal arts schools usually operate – requiring students to take courses in a series of different subjects, from math to languages to science. Then, I add, Amherst is the same but it gets rid of those requirements. “So, it’s just like Vic?” these students ask, referring to Victoria by its nickname. Of course, Amherst College is, academically-speaking, very different from the Victoria University of Wellington. In part, this is simply due to the differences in size – Amherst’s student body of 1,750 undergraduates is dwarfed by Vic’s 16,750 undergrads. Thus, I’ve taken many more lecture-style courses here than I did at Amherst, and the school is structured to accommodate these greater numbers of students. Other aspects, however, are because the American and New Zealand tertiary education systems are run differently, with different ideals in mind. 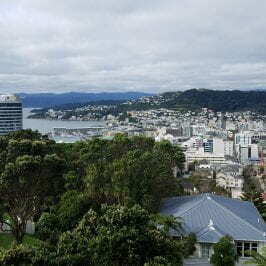 Although students at New Zealand universities don’t have to declare their major at the start of their education, students do usually apply to particular programs and rarely venture outside of them (unless they are targeting a second degree). Meanwhile, in the United States universities and colleges of all sizes encourage some amount of academic exploration and experimentation. What this means is that New Zealand students often graduate with a deeper understanding of their chosen topics than American students might. 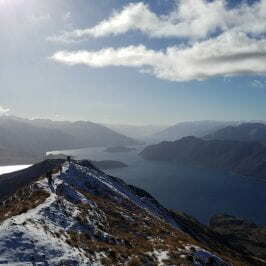 College for Americans is often characterized as a place to engage in a sense of academic “finding oneself,” while in New Zealand university is much more pointed towards a degree. I don’t know which system is better, if any, but it is interesting how tertiary education serves slightly different purposes in different countries. The grading scale was much more lenient at Victoria, but the grades themselves were stricter. An essay I wrote for one history class received an 85, which at Victoria is an A. That same essay would still have received an A at Amherst (I believe), but with a higher numerical score because an 85 at Amherst is not an A. Personally, I have taken courses in two subjects while in New Zealand, History and Political Science. The former is my major and the latter is a matter of personal and professional interest. In that regard, perhaps I chose my course load more in the New Zealand style this semester. Regardless, I certainly found myself learning in a style unique to large universities and New Zealand schools. Each of my classes – which ranged in size from 20 to 200 students – was taught lecture style. In all but one, we had at least two guest lectures over the course of thirteen weeks. Supplementing these lectures were tutorials, essentially TA sessions. Each course had one tutorial a week, and tutorials had from 10 to 20 students each. In these, we engaged in discussions, group activities, and reviews of the readings. I found that I much preferred the tutorials to the lectures. It was easier for me to engage with the learning material in these formats than in the lectures. That said, the lectures were helpful in delivering a greater amount of information than a discussion might be able to do. This dual approach to learning was of course different from my usual seminar-style courses in the Humanities at Amherst, but I managed to adapt to it quite easily. The discussions, too, were different in the two schools. At Amherst, discussions tended to be much more lively, but I felt that people came from a greater range of perspectives during discussions at Vic. When conversations here in New Zealand did become involved, they were just as interesting as those in Amherst – but this was simply a less common occurrence both due to the structuring of class (lectures vs. tutorials) and the general academic culture. Indeed, “tall poppy syndrome” is something that was often mentioned to me as a new student at Vic and may have contributed to this. There is a widespread belief that many Kiwis, including students, don’t reward and congratulate others for their success but rather attempt to cut them down. This isn’t something I experienced personally, but friends of mine discussed it with me. In part, I may have been spared because I was working in less competitive areas – the Law and Commerce schools are particularly notorious for their “tall poppy” students. None of this is to say that Victoria University has an education style that is more “conventional” than Amherst’s. In one of my political science classes, the professor intentionally imposed authoritarian policies until the students were forced to revolt. My time in New Zealand has exposed me to a handful of new ways to teach and to learn. I am not sure whether certain methods are due to Victoria University’s status as a large university or a New Zealand school, but they are new and intriguing to me nonetheless, and the sort of experience I could only have had on study abroad.